Russia's aerospace industry has displayed enormous creativity in missile design over the last 25 years, spanning the turbulent last decade of the Cold War, and the post Cold War era. During this period we have seen the incremental evolution of weapons established in service in the last years of the Cold War, the deployment of projects started during the Cold War, and a good number of entirely new projects which emerged during the 1990s period. 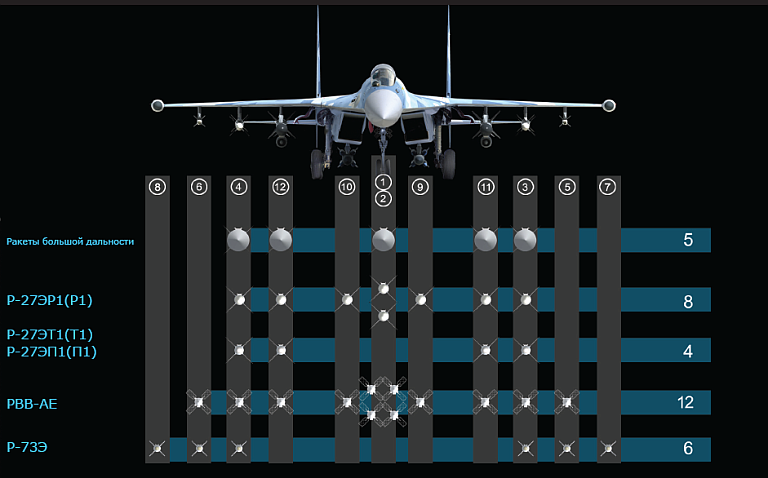 The operators of Russian fighters can now access a remarkably diverse range of weapons, available more than often with a range of different seekers sharing common airframes, or common seeker designs integrated into different airframes. The result of this diversity in airframe performance and seeker capabilities is a veritable nightmare for Western planners as well as designers of electronic and infrar-red countermeasures suites. An inbound BVR missile could be equipped with one of several different semi-active radar homing, active radar homing, infrared-homing or passive X-band anti-radiation homing seekers. The missile might be using one of several possible airframes or derivatives, with diverse kinematic performance. 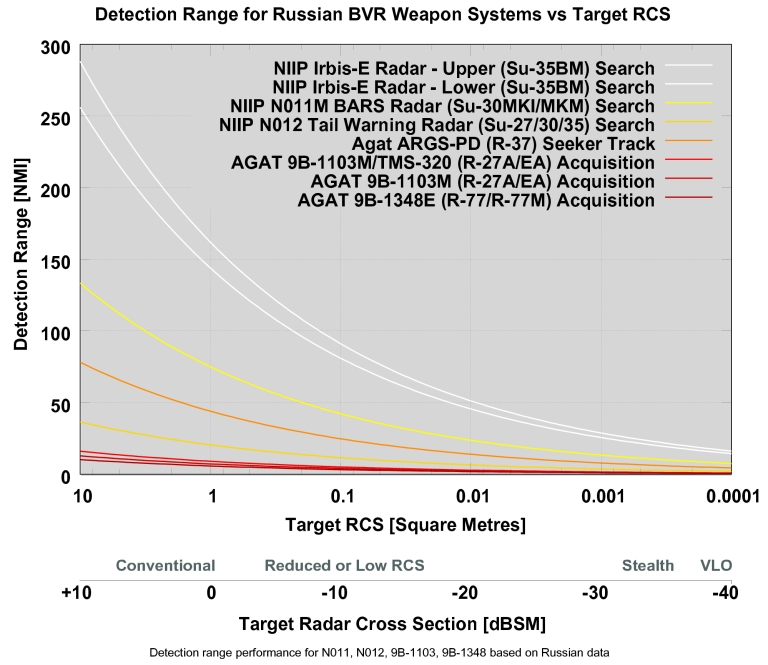 The aim of this analysis is to explain the thinking underpinning Russian Beyond Visual Range missile capabilities, test these against Western capabilities, and map out the known derivatives of the most commonly used Russian BVR AAM airframes and seekers, accepting that there is likely to be just as much Western observers do not know, in terms of alternate seekers and airframes. Australian readers should note that considerations of Russian capabilities and technique in BVR combat have clearly not been factored into any recent force structure planning for the RAAF, despite these capabilities now arriving in the region. 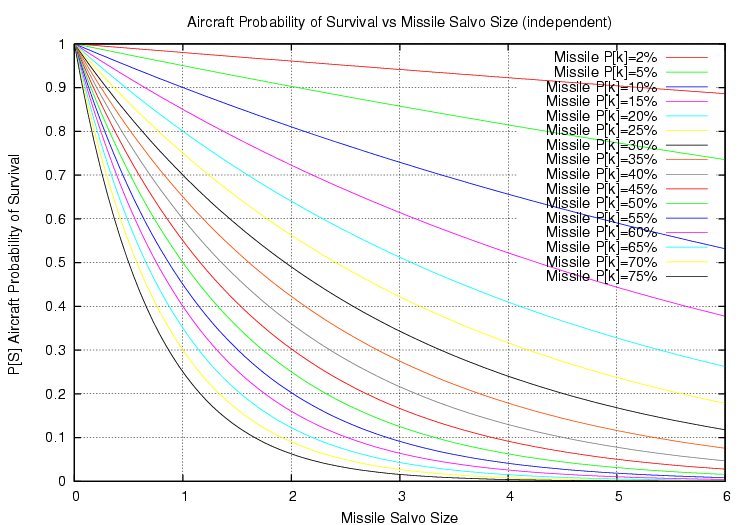 The mathematics of multiple round missile engagements are unambiguous - the size of a missile salvo launched is a stronger driver of success than the actual kill probability of the individual missiles. 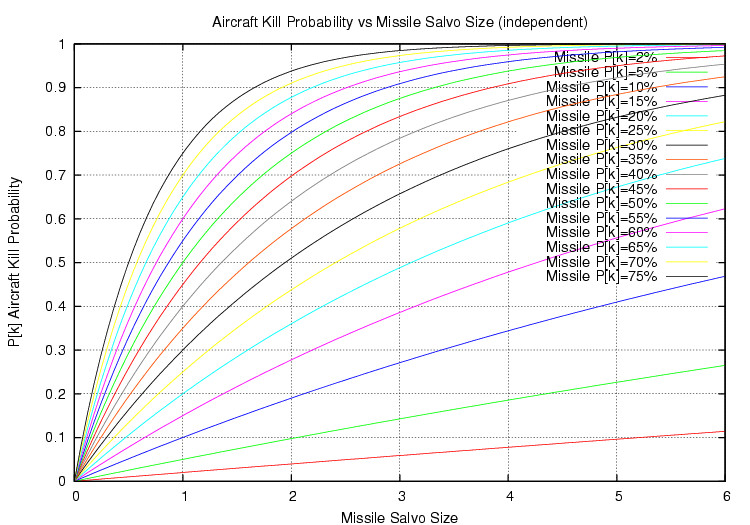 If the missiles are wholly identical by type, then the following curves may be optimistic, insofar as a factor degrading the kill probability of one missile is apt to have a similar effect on its siblings in a salvo. However, where the missiles differ by seeker type and guidance control laws, then the assumption of statistically independent missile shots is very much stronger. 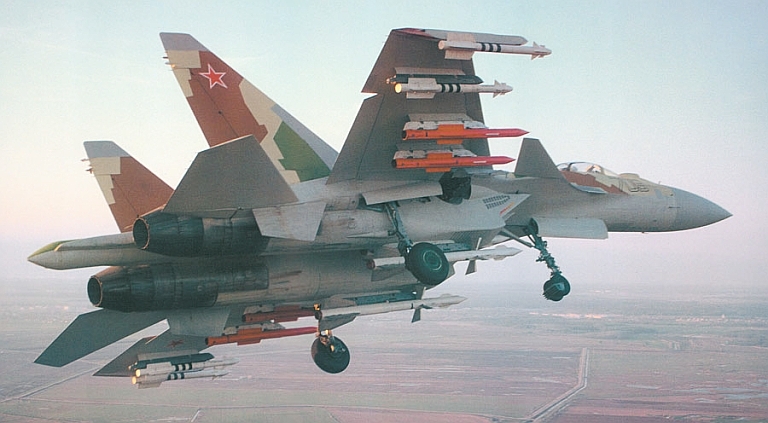 A question often asked is why are Sukhoi Flanker variants equipped to carry between eight and twelve BVR missiles? The answer is a simple one - so they can fire more than one three or four round BVR missile salvo during the opening phases of an engagement. In this fashion the aircraft being targeted has a difficult problem as it must jam, decoy and/or outmanoeuvre three or four tightly spaced inbound missiles. Even if we assume a mediocre per round kill probability of 30 percent, a four round salvo still exceeds a total kill probability of 75 percent. 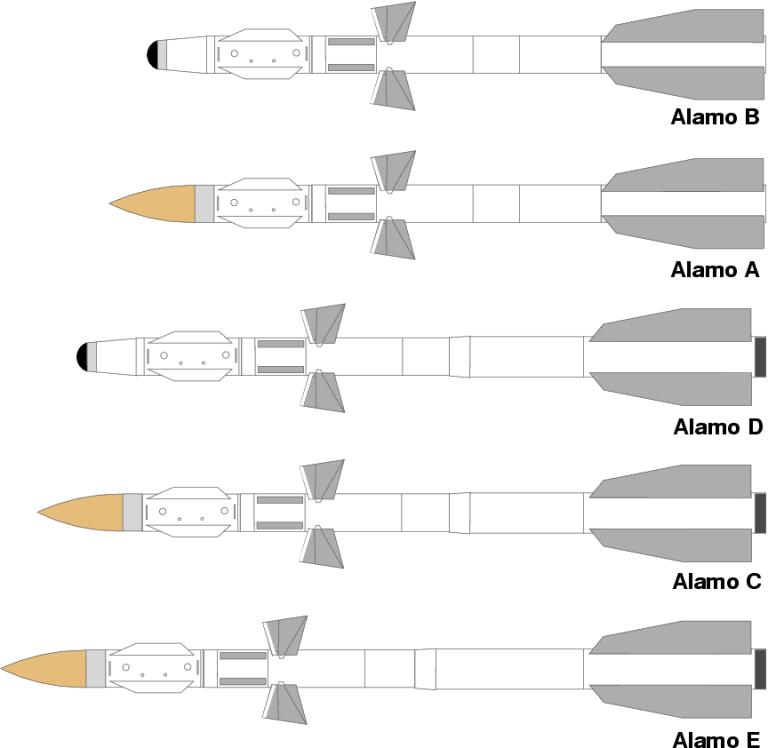 Loadout options for Su-35BM/Su-35-1: 5 x Long Range AAM (R-172/AAM-L); 8 x R-27ER1/R1 Alamo; 4 x R-27ET1/T1 or R-27EP1/P1 Alamo; 12 x R-77/RVV-E Adder; 6 x R-73E Archer. The loadout for the active radar seeker equipped R-27EA would be 8 rounds (KnAAPO). 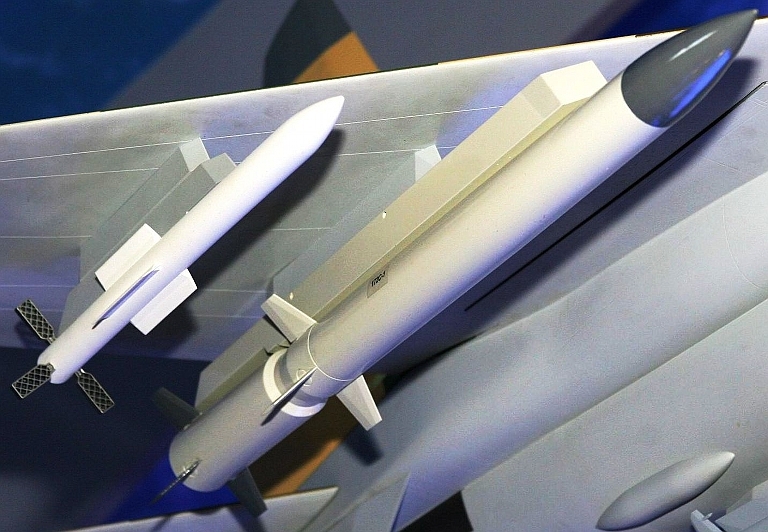 A critical question which must be asked when assessing the effectiveness of Russian BVR tactics is that of Western tactics and the effectiveness of the AIM-120 AMRAAM, the principal Western BVR fighter weapon. 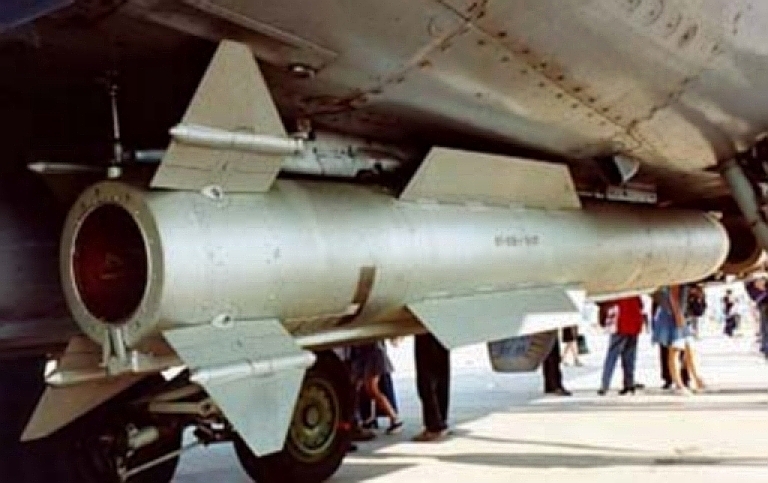 The AIM-120A AMRAAM was introduced at the end of the Cold War to provide a "fire and forget" active radar guided weapon with a midcourse inertial guidance system and datalink support provided by the radar on the launch aircraft, allowing multiple concurrent shots. The AIM-120A was followed by the incrementally improved B-model, and then by the "short span" AIM-120C-3 sized to fit the F-22A weapon bay. The AIM-120C-4 has better kinematic performance introducing a larger rocket motor and shorter control section, and a better warhead, while the AIM-120C-6 introduced a better fuse. The latest AIM-120D introduces a redesigned seeker built for better durability in high vibration carriage environments, a two way datalink, GPS to supplement inertial guidance, incrementally improved kinematics, and better seeker performance against high off-boresight targets. 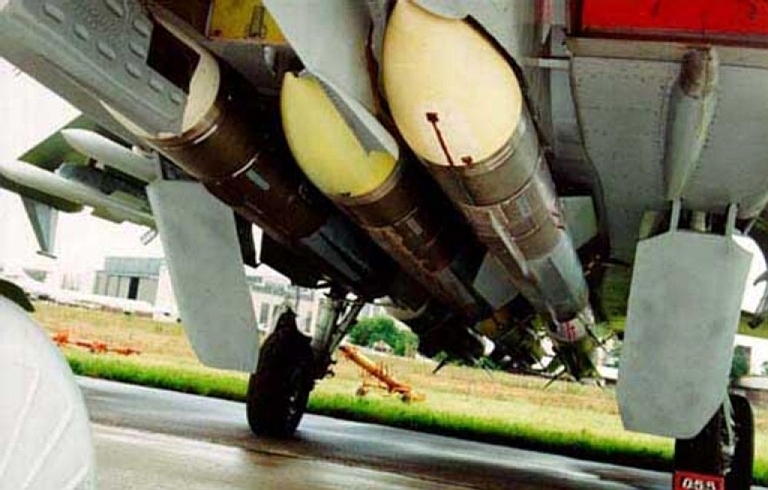 Most AIM-120 AMRAAM kills to date have involved 1980s export variants of the MiG-29 Fulcrum, with mediocre electronic warfare fit and often inoperative systems. These are not representative targets in the current Pacific Rim environment. The performance of the AIM-120A/B/C models in combat to date has not been spectacular. Test range trials have resulted in stated kill probabilities of 85 percent out of 214 launches for the AIM-120C variant. Combat statistics for all three variants are less stellar, amounting to, according to US sources, ten kills (including a friendly fire incident against a UH-60) of which six were genuine BVR shots, for the expenditure of just over a dozen AIM-120 rounds. The important parameter is that every single target was not equipped with a modern defensive electronic warfare package and therefore not representative of a state-of-the-art Flanker in a modern BVR engagement. Against such "soft" targets the AIM-120 has displayed a kill probability of less than 50 percent . 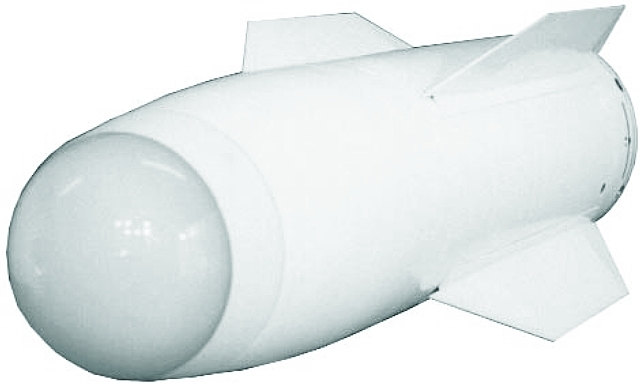 It is an open question whether the AIM-120D when challenged with a modern DRFM (Digital RF Memory) based monopulse trackbreaking jammer will be able to significantly exceed the 50 percent order of magnitude kill probability of prior combat launches, let alone replicate the 85 percent performance achieved in ideal test range conditions . Where does this leave Western air forces equipped with the AIM-120 when confronting Flankers armed with up to three times the number of BVR missiles? Illustrative examples are the F/A-18E/F Super Hornet and F-35 JSF, the latter armed in an air superiority configuration with two, the former with up to six AIM-120s . 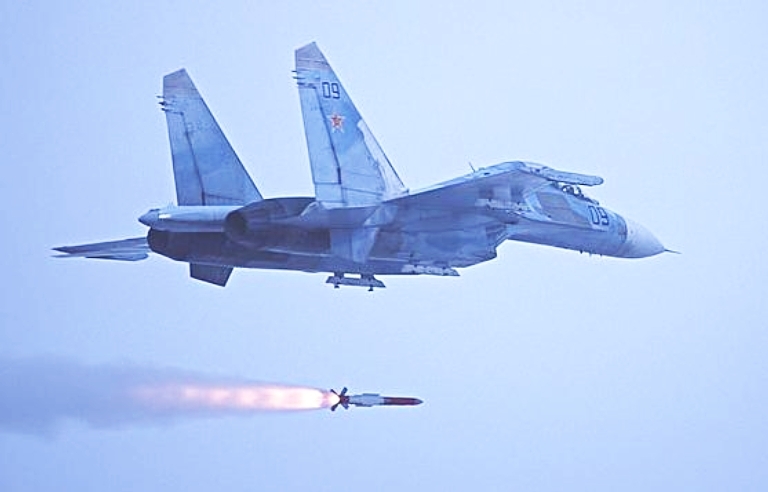 Assuming the Flanker driver does not exploit his superior missile kinematic range and shoot first - an optimistic assumption - then the best case kill probability for the AIM-120 shooter firing two to four rounds is better than 90 percent. However, if we assume that hostile jamming and manoeuvre degrade the kill probability to around 50 percent - a reasonably optimistic statistical baseline here - then the total kill probability for a two round salvo is optimistically around 75 percent, and for a four round salvo over 90 percent. Arguably good odds for the four round salvo, only if the missile kill probability sits at 50 percent, but the F/A-18E/F or F-35 JSF will have expended all or most of its warload of AIM-120s and be unable to continue in BVR combat. In a "many versus many" engagement, the low speed of both types leaves them unable to disengage and will see both types subsequently killed by another Flanker. This best case "many versus many" engagement scenario sees the F/A-18E/F or F-35 JSF being traded one for one with Su-30MK/Su-35BM Flankers in BVR combat, which is the general assumption made for WVR combat between like opponents, and representative of many historical attrition air campaign statistics. To achieve this best case "many versus many" outcome of trading F/A-18E/F or F-35 JSF one for one, we have stacked a series of assumptions against the Flanker - dumb Flanker pilots not exploiting a missile kinematic range advantage, dumb Flanker pilots not exploiting a firepower advantage, Russian BVR missile seekers no better than the AIM-120, and Russian DRFM monopulse jammers achieving a less than 50 percent degradation of AIM-120 kill probability . A competent Flanker driver gets the first shot with three or four round salvo of long burn R-27 variants, with mixed seekers, leaving one or two remaining salvoes of BVR missiles on his rails, and the same Flanker driver will have modern DRFM monopulse jammers capable of causing likely much more than a 50 percent degradation of AIM-120 kill probability. With a thrust vectoring engine capability (TVC), the Flanker driver has the option of making himself into a very difficult endgame target for the AIM-120 regardless of the capability of his jamming equipment. Since all of the AIM-120s fired are identical in kinematic performance and seeker jam resistance, any measure applied by the Flanker driver which is effective against one AIM-120 round in the salvo is apt to produce the same effect against all AIM-120 rounds - a problem the Flanker driver does not have due to diversity in seeker types and missile kinematics. Currently classified capabilities such as the use of the APG-79 or APG-81 AESA radar as an X-band high power jammer against the Russian BARS or Irbis E radar are not a panacea, and may actually hasten the demise of the F/A-18E/F or F-35 JSF in a BVR shootout. This is for the simple reason that to jam the Russian radar, the APG-79 or APG-81 AESA radar must jam the frequencies being used by the Russian radar, and this then turns the APG-79 or APG-81 AESA radar into a wholly electronically predictable X-band high power beacon for an anti-radiation seeker equipped Russian BVR missile such as the R-27EP or R-77P. The act of jamming the Russian radar effectively surrenders the frequency hopping agility in the emissions of the APG-79 or APG-81 AESA radar, denying it the only defence it has against the anti-radiation missile. A smart Russian radar software designer will include a "seduction mode" to this effect, with narrowband emissions to make it very easy even for an early model 9B-1032 anti-radiation seeker. The flipside of the electronic combat game is no better. The F-14A/B/D included the AAS-42 Infrared Search and Track set which allowed a target to be tracked despite hostile jamming of the AWG-9/APG-71 radar. It is clear that the addition of the podded AAS-42 to the Super Hornet and "air to air" use of the JSF EOTS are intended for much the same purpose. While this may permit the continuing use of the AESA radar to datalink midcourse guidance commands to the AIM-120s, it does nothing to deny the Flanker its own BVR shot. The notion that the defensive jamming equipment and infrared decoys will be highly effective against late model Russian digital missile seekers can only be regarded to be optimistic. In electronic warfare terms neither side has a decisive advantage, but the Flanker does have a decisive advantage in aircraft and missile kinematics and in having up to six times the payload of BVR missiles to expend. 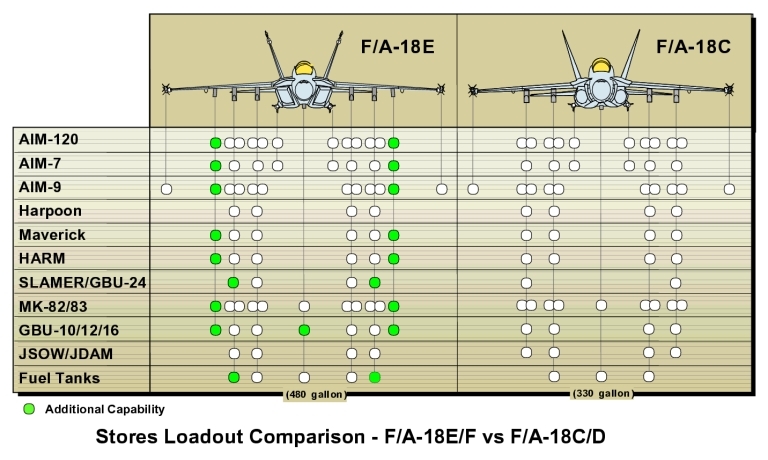 The simple conclusion to be drawn is that operators of the F/A-18E/F or F-35 JSF should make every effort to avoid Beyond Visual Range combat with late model Flankers, as the best case outcome is parity in exchange rates, and the worst case outcome a decisive exchange ratio advantage to the Flanker. Given the evident design choices the Russians have made, this is not an accident, but rather a consequence of well thought through operational analysis of capabilities and limitations of contemporary BVR weapon systems. The achievable kill probability of any missile depends on its kinematic performance, especially during the endgame phase of flight, against the intended target, and the performance of its seeker and fusing subsystems, especially in a countermeasures environment. Until the 1980s Soviet missile technology lagged the West in propellants, airframe designs, and guidance designs. That changed with the deployment of the R-27 and R-73 missiles during the 1980s, as these competed on a equal footing, or outperformed their Western equivalents. In kinematic terms, the WVR R-73 series, and the BVR R-27 and R-77 are highly competitive against their Western equivalents, and the long burn variants of the R-27 outperform all Western solid propellant competitors. The next evolutionary step for Vympel is the production of the air breathing ramjet RVV-AE-PD design, displayed since the 1990s at numerous trade shows. 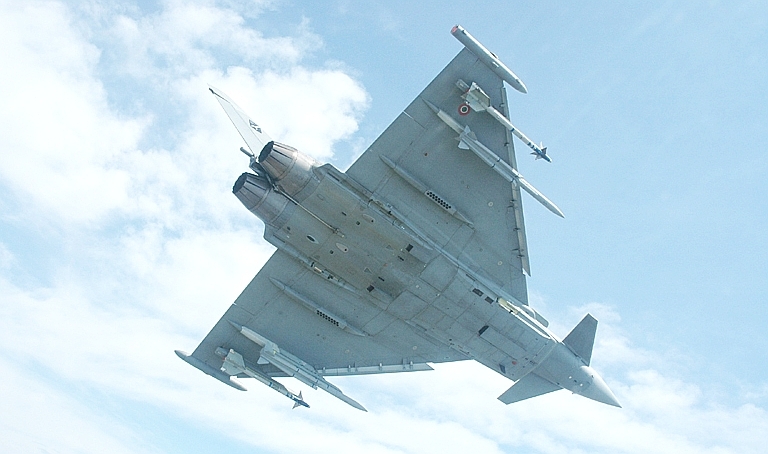 This missile spurred the development of the Meteor for the Eurofighter Typhoon. 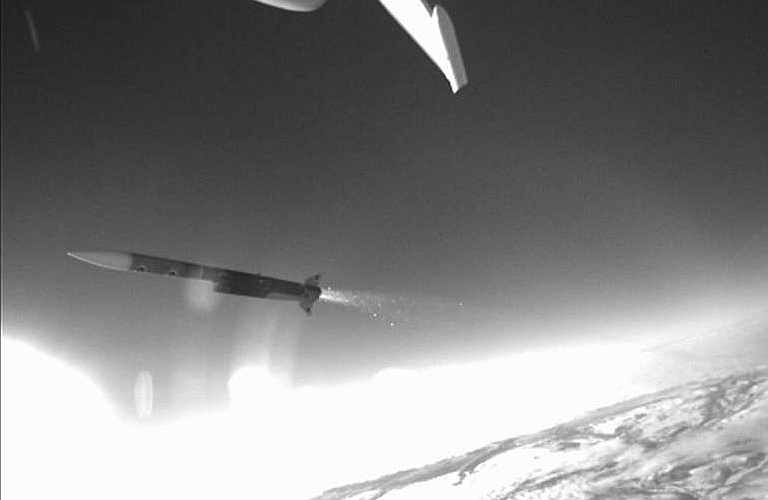 The attraction of ramjet BVR AAMs lies in their ability to sustain thrust and thus turning performance in the endgame phase of an engagement, where conventional soild rocket missiles are flying on inertia alone and rapidly lose speed when turning. It is worth noting that the high lethality of late generation WVR missiles like the Python 4/5 is in a large part due to the missile's ability to sustain ~100G class load factors during the endgame manoeuvre, precisely the regime in which most BVR missiles fail to kill their targets. 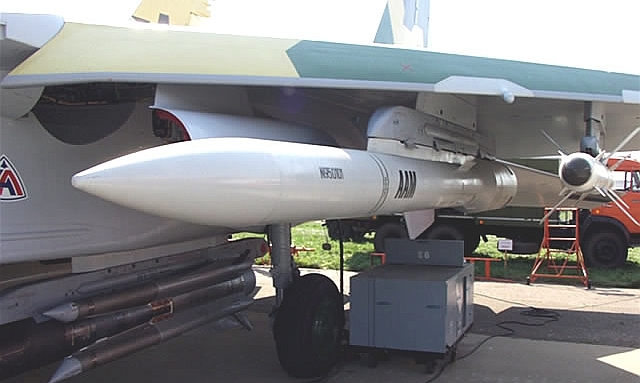 Range extension options for the baseline R-77 include booster packs, discussed in Russian literature, or larger diameter rocket motors containing a larger propellant load, the latter proposed some years ago for R-77-ZRK surface to air derivative of this missile. In terms of kinematic performance, a key factor which is almost universally ignored by Western planners other than the F-22 and F-111 communities, is the impact of the launch aircraft's kinematics at the point of missile launch. A supersonic Su-35 sitting at Mach 1.5 and 45,000 ft will add of the order of 30 percent more range to an R-27 or R-77 missile. Low performance fighters like the F/A-18E/F and F-35 JSF simply do not have this option in the real world, and the reach of their missiles is wholly determined by the parameters of the propellant load inside the missile casing, and the ability of the midcourse guidance algorithms to extract every bit of range from that stored energy. The result of this is that an AIM-120C/D which might look better on paper compared to an equivalent R-77 subtype will be outranged decisively in actual combat. Russian seeker technology has advanced in strides since the early 1990s, largely as a result of the commodification of Gallium Arsenide monolithic chips and digital signal processing chips in the globalised world market. Agat, which manufactures the 9B-1101K semi-active radar seeker for the R-27EP/P, the 9B-1103K active seeker for the R-27EA/A, and the 9B-1348E seeker family for the R-77 missile family, publicly disclosed some years ago the use of the Texas Instruments TMS-320 series digital signal processing chip in a late model 'digital' variant of the 9B-1103K seeker. This chip is a mainstay of Western military radar design. The move away from analogue and hardwired digital seekers to software programmable digital seekers is an important milestone for the Russian industry, since it opens up many choices in signal processing and counter-countermeasures techniques hitherto only used by US, EU and Israeli manufacturers. 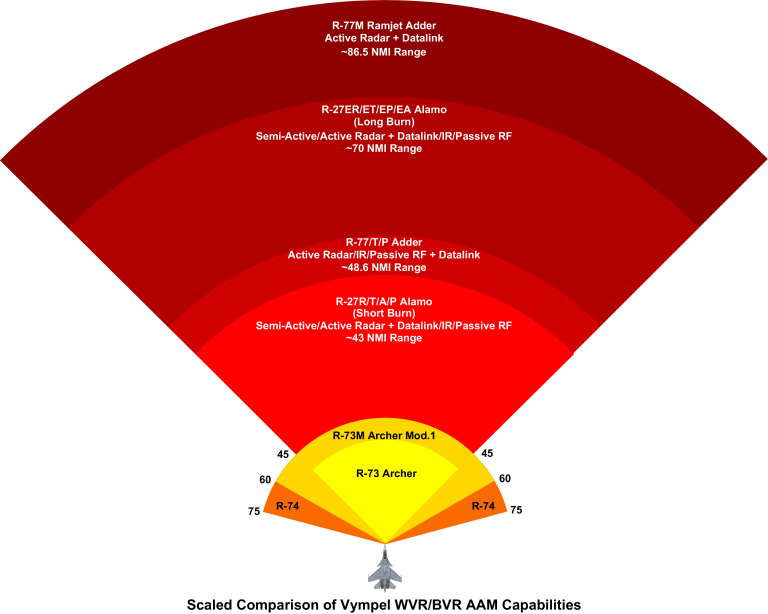 In practical terms a later model digital variant of the 9B-1103K or 9B-1348E will be no less difficult to defeat by jamming than Western equivalent active seekers . The monopulse slotted planar array antenna technology used in the 9B-1103K and 9B-1348E seekers compares closely to the antenna technology seen since the AIM-120A was deployed, and due to its dual plane monopulse design provides good resistance to a range of legacy jamming techniques. Russian concern about Western countermeasures is reflected in a propensity since the 1980s to use dual plane monopulse seeker designs, and even the baseline Agat 9B-1101K semi-active homing seeker in the R-27R/ER variants is a classical monopulse design, built for high jam resistance (refer photos). The infrared homing seeker technology used in Russian BVR missiles has also evolved considerably since the Cold War. Early R-27 Alamo variants used the legacy Geofizika 36T seeker. There are claims that more recent variants use the far more agile Arsenal Central Design Bureau Mayak/MK-80M seeker series, developed for the R-73M Adder WVR missile, and since then announced by Vympel as the seeker for the initial heatseeking variants of the R-77 Adder. 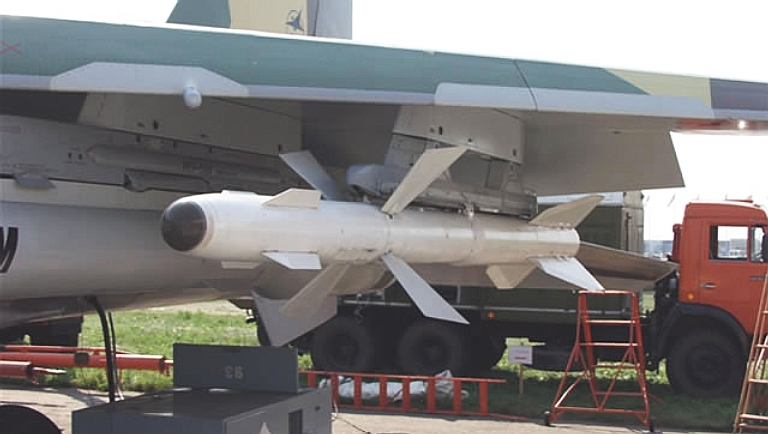 The R-73 series WVR missiles have evolved, to the extent that the 'digital' K-74E variant is a highly competitive scanning two colour design, inherently resistant to many flares and with the counter-countermeasures flexibility inherent in software programmable guidance systems. Given the established pattern of migrating extant WVR missile seekers into BVR missiles, it is a safe prediction that late build heatseeking R-27ET/Ts and early build heatseeking R-77Ts are likely to use late build derivatives of the Arsenal MK-80M series, such as the MM2000 subtype. The latest generation of Western WVR missiles employ Focal Plane Array seekers with target recognition capability and high resistance to infrared countermeasures. 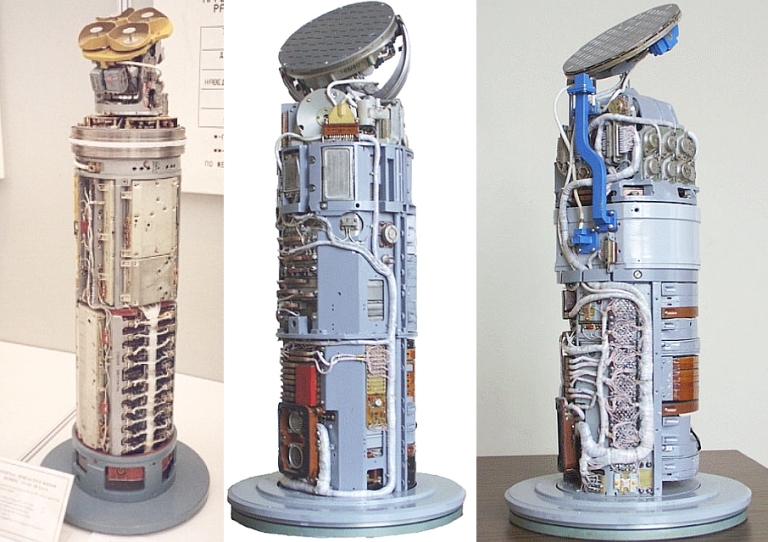 Depicted imagery from the seeker of a Raytheon AIM-9X missile, which uses an Indium Antimonide bandgap detector array. Russian industry is working on such an FPA seeker, what is unclear is whether it will employ bandgap detector or superior two colour QWIP technology. When it enters production it is likely to become a block upgrade and new production item for BVR missiles such as the R-27ET and R-77T. It is well known that Russian industry is working on a Focal Plane Array (FPA) seeker for their future WVR missiles, to compete against the ASRAAM, AIM-9X, Iris-T and Python 5 seekers, adding further infrared counter-countermeasures capabilities. The open question is whether the future Russian FPA seeker will match the midwave Indium Antimonide detector array technology in the Raytheon 256x256 device in the ASRAAM/AIM-9X, or whether the Russians will leapfrog a generation and opt for much more capable QWIP (Quantum Well Imaging Photodetector) technology pioneered by Germany's industry during the late 1990s. 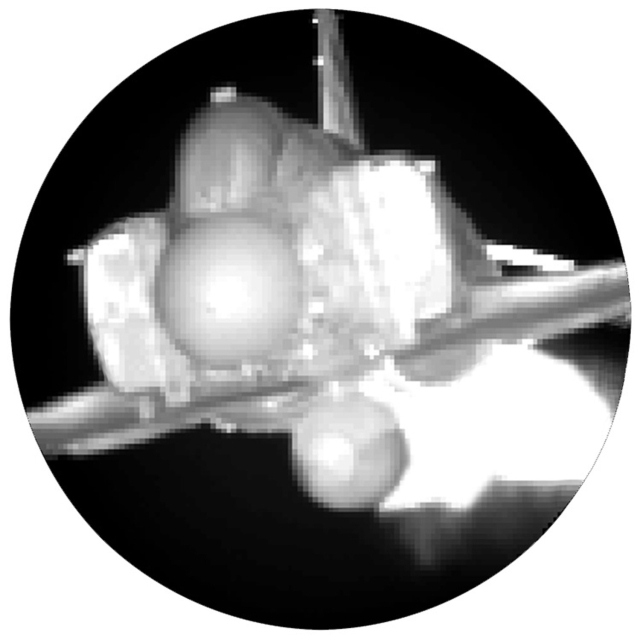 There is considerable Russian scientific literature available on QWIPs, which allow a single chip to concurrently image targets in two infrared colour bands, and permit tailored infrared colour sensitivity absent in bandgap detector technology such as the legacy InSb designs used in ASRAAM and AIM-9X seekers. With the exception of the now retired F-117A, and the remaining B-2A, infrared emissions are a major signature issue for low observable fighters. While the low observable technology used is generally good against the upper radar bands, it is less so against high performance lower band infrared sensors. A QWIP based missile seeker operating in the LWIR bands (8-12 micron and 15 micron) has the potential to be quite effective, if the midcourse guidance scheme can get the BVR missile close enough to acquire the target. Details of the Avtomatika 9B-1032 passive X-band RF anti-radiation seeker remain classified at this time, and even the antenna configuration has not been disclosed to date. This remains a unique capability in the R-27EP/P Alamo and R-77P Adder. What is clear is that the drive to digitise all Russian AAM seekers will be reflected also in anti-radiation seekers. It is known that the PLA has funded Russian development of new passive seeker technology for this application. Fusing technology in use includes radio-frequency proximity fuses and in more recent designs, active laser proximity fuses. From a Western strategic planning perspective the key development in Russian BVR missile seeker technology over the last decade has been the move away from legacy analogue techniques to digital software programmable techniques. 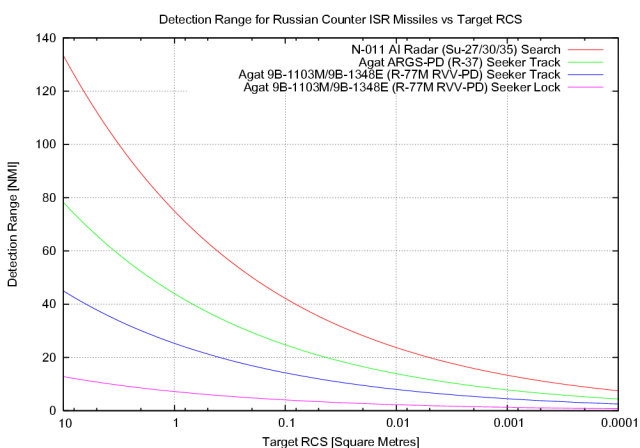 This permits Russian designers enormous flexibility in embedding counter-countermeasures modes into these seekers, as well as enormous opportunities in smart signal processing to maximise detection range performance. Digital autopilot technology has been pivotal to optimising the kinematic capabilities of Western missiles and this technology is now available to Russian designers. 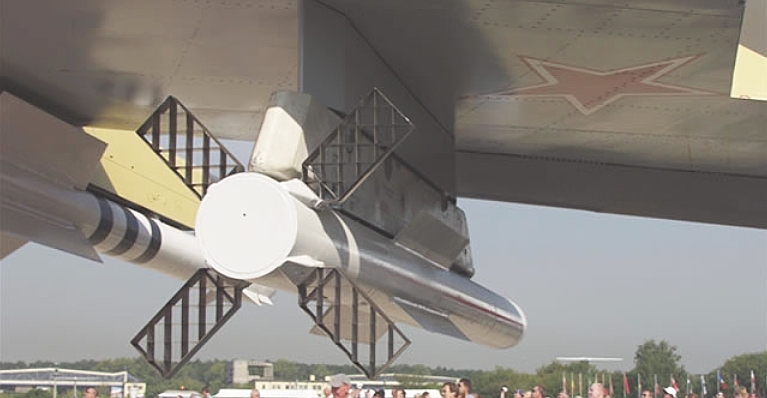 What is unclear from Russian literature at this time is whether there is an intent to expand the range of seeker technologies to increase kill probabilities in countermeasures intensive environments, and against low observable targets. Other than incremental development of extant seekers, there are options in the upper millimetric wave bands, and in LIDAR/LADAR (laser radar) technologies. While these may suffer similar weather penetration limitations to passive infrared sensors, this is often irrelevant in high altitude BVR combat above the tropopause. There are no fundamental technological reasons why extant microwave band radar seekers and laser homing seekers cannot be evolved to provide additional millimetric band and laser based seekers, respectively. 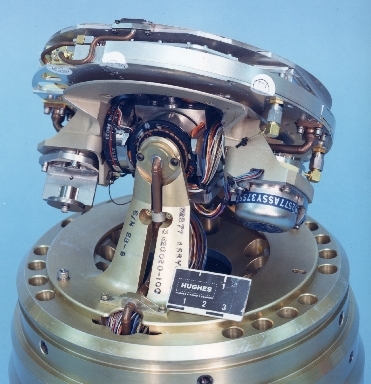 Multimode (or multispectral) seekers have not been common to date in Western or Russian missiles, mostly for reasons of cost and complexity - the best know examples being the RIM-116 Rolling Airframe Missile (RAM) and RIM-7R Sparrow, combining passive radiometer and semi-active radar homing guidance with heatseeking guidance, respectively. Larger BVR missiles like the R-37 and AAM-L easily have the seeker volume to accommodate a multimode seeker and we should not be surprised to see either weapon gain an additional infrared guidance capability, given the cost of these missiles and the very high value of their intended targets. What may not be profitable in smaller missiles becomes profitable in a counter-ISR missile. One interesting Russian development, which underscores the willingness of Russian industry to experiment, is the Agat 9B-1103K-150 "Hummingbird" seeker, a downsized derivative of the R-27EA/RVV-AE seeker family sized to fit into an R-73/R-74 Archer WVR AAM seeker. The reasoning behind this evolution has not been disclosed to date. There are two obvious possibilities. The first is an active radar guided R-73/R-74 Archer derivative to provide counter-countermeasures diversity in close combat. Another possibility, given the Russian history of two stage or booster equipped missiles, is mating a 9B-1103K-150 or MK-80M/MM-2000 equipped R-74 terminal stage with a BVR capable long range midcourse stage for instance derived from the R-27 or R-37 series. Such a weapon would use the jettisonable midcourse airframe to effectively deliver the high kill probability terminal kill airframe into close proximity of the target. While such a weapon would be more complex than established BVR missile designs, it would overcome the primary deficiency of most such designs, in endgame lethality. As with other key areas of aerial warfighting technology, Russia's industry has entered the globalised digital age and is making full use of the technological gains to be had. Su-35S demonstrator with exposed Irbis-E phased array and 90 degree off boresight steerable OLS-35 IRST turret. The now well established trend in Russian sensors for BVR combat is increasing range performance and countermeasures resistance. The 20 kiloWatt peak power N035 Irbis E radar is the most powerful in its class. (KnAAPO). Su-35S demonstrator displaying the R-172/AAM-L, the R-27ET1 Alamo and the R-77 Adder at MAKS 2007 (KnAAPO). Late Cold War US DoD image of V-PVO Su-27 armed with a mix of R-27T, R-27R and R-27ER Alamo variants. The Vympel R-27 is the Russian contemporary to the late model US AIM-7 Sparrow series BVR missiles, but the similarity ends there since the R-27 is available in a plethora of variants, and is a much larger weapon. The basic airframe is supplied in long and short burn variants with differing range performance, and with heatseeking or datalink aided inertially midcourse guided semi-active radar seekers. The R-27R1 and R-27ER1 are the radar guided long burn (Energeticheskaya) and short burn versions, respectively, credited with F-pole ranges of 70 nautical miles and 43 nautical miles. The R-27T1 and R-27ET1 are the respective heat seeking equivalents, credited with slightly lower engagement ranges. Russian sources claim early heatseeking variants used the 36T seeker, and more recent variants an adaptation of the MK-80 seeker used in a range of high off-boresight capable R-73 Archer subtypes. The Avtomatika 9B-1032 X-band anti-radiation seeker equipped R-27P/EP has been reported, designed to kill emitting fighters in the forward quarter by homing on their radar emissions. It is the first anti-radiation homing air to air missile ever deployed in quantity, and the seeker is credited with a detection range of ~130 nautical miles. It is also reputed to be one of the fastest air to air missiles ever built. More recently Agat have offered new build or retrofit active radar seekers as the R-27A/EA, the Agat 9B-1103M, derived from the R-77 9B-1348E seeker. The latest subtype of this seeker is claimed by Agat to use the Texas Instruments TMS-320 digital signal processing chip, widely used in Western radar equipment. 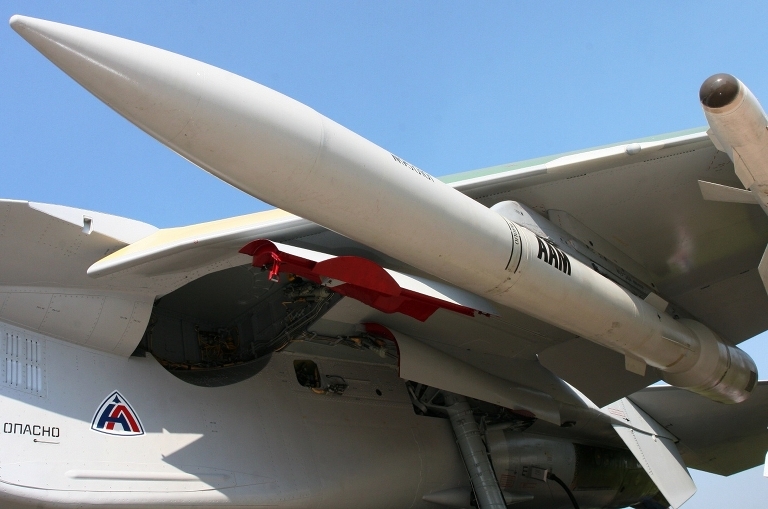 While the R-27 series is a late Cold War legacy design, slightly predating the AIM-120A AMRAAM, it has good kinematic performance in the long burn variants and is likely to remain in production until displaced by the ramjet variants of the R-77 family. Comparison of short burn R-27T1 heatseeker and long burn R-27ER SARH variants. Note the larger motor of the latter variant (KnAAPO). Long burn R-27ET1 heatseeker variant under the wing of an Su-35 demonstrator (KnAAPO). Geofizika Central Design Bureau / Azov Optical and Mechanical Plant Production Association 36T infrared homing terminal seeker used in the baseline R-27T, R-27ET, R-27T1 Alamo B/D missiles. It is likely that late build weapons have been fitted with the more agile high off boresight capable MK-80M series seekers intended for the R-77T Adder. 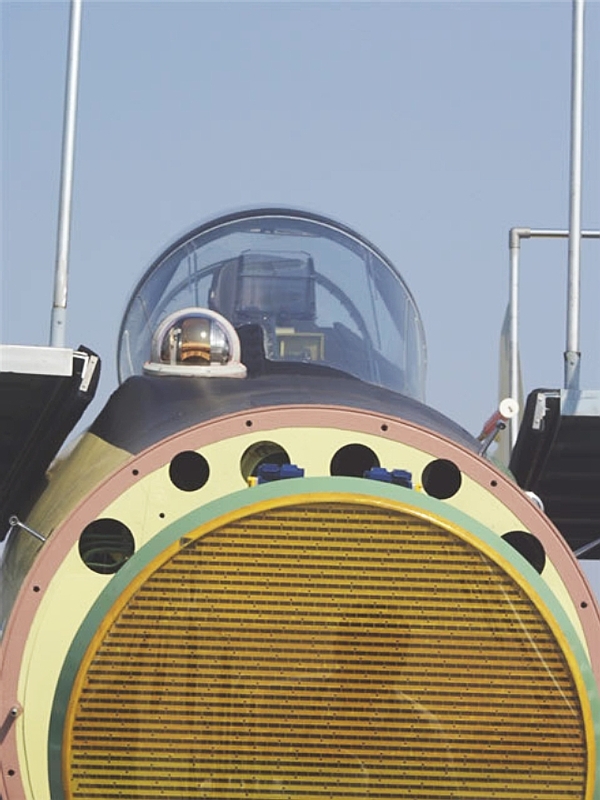 This image shows a production seeker rather than demonstration prop, as the nose window is clearly fabricated from Magnesium Fluoride, a commonly used material for high speed missile MWIR transparent windows (via Missiles.ru). The most recently exported missile in the Asia-Pacific region is the Vympel R-77 RVV-AE (AA-12 Adder), the "AMRAAM-ski". This missile, with unique lattice controls, is a modern BVR weapon designed to kill 12G manoeuvring targets, and credited with an A-pole range of 54 nautical miles, although some reports suggest early production rounds were not delivering the kinematic performance advertised, not unlike early AIM-120A AMRAAMs. As the R-77 has AMRAAM-like capabilities, it permits a Flanker to launch multiple rounds and guide these concurrently, engagement geometry permitting. As the R-77 matures, we can expect to see refinements in propellants, autopilot kinematics and seeker jam resistance. The designation R-77M is often used for the ramjet derivative, but also for an enhanced later production variant with a higher impulse rocket motor. Alternate seekers for the R-77 have been advertised - the heatseeking R-77T using an MK-80M seeker from the R-73M and R-27T, and the antiradiation seeker equipped R-77P. The deployment of the new F-22A Raptor will see significant pressure on Vympel to supply heatseeking, anti-radiation and electro-optical imaging seekers on the R-77/R-77M in an attempt to counter the combined kinematics and all-aspect stealth of the F-22A. While such seekers may do little to offset the overwhelming advantages of the supercruising F-22A, they are likely to prove quite effective against inferior types such as the F-35 JSF, F/A-18E/F, late model F-15E and F-16C/B50. If the Flanker can close to a range where an advanced LWIR (longwave) IRST can track the target, an optical seeker equipped R-77 variant can be used to effect an engagement, defeating the RCS reduction measures on these aircraft. The anti-radiation R-77P could be used to engage at maximum missile range. 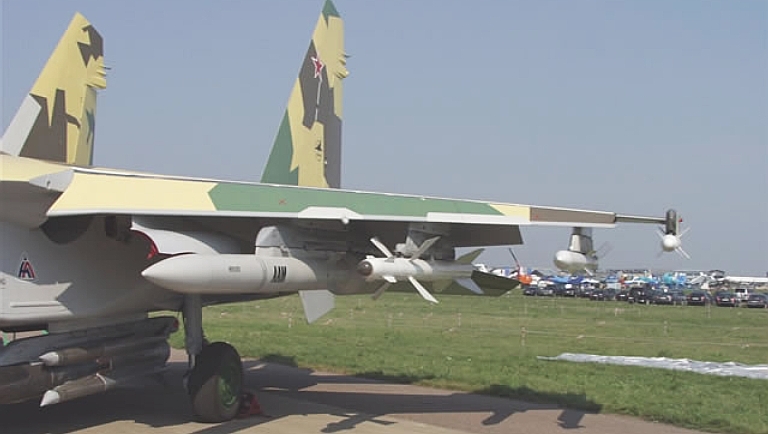 R-77 Adder under the wing of an Su-35 demonstrator at the MAKS 2007 display (KnAAPO). 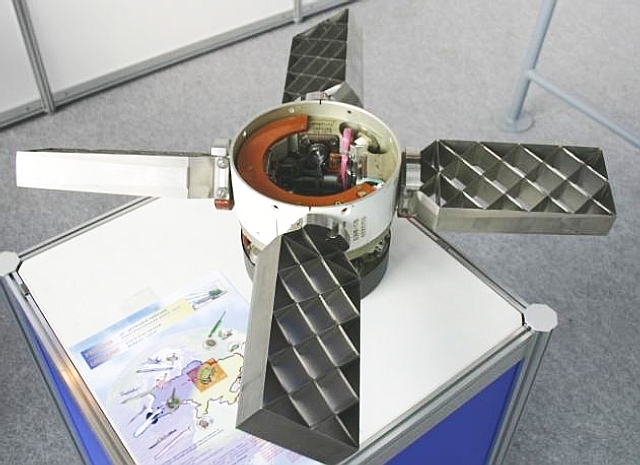 The R-77 series uses unique lattice tail controls (Vympel). The Vympel R-77M-PD RVV-AE-PD (Povyshlenayya Dal'nost') ramjet Adder is credited with an A-pole range of around 80 nautical miles. This missile is a direct derivative of the R-77 series, but like the MBDA Meteor for the Eurofighter Typhoon, employs ramjet propulsion to extend its burn duration and range. It will provide much higher endgame G capability than the baseline R-77 airframe. Another extended range derivative of the basic R-77 is the R-77-ZRK subtype, developed as a Surface to Air Missile and incorporating a much larger diameter centre fuselage, intended to carry significantly more propellant. It is not known whether the R-77-ZRK has entered production. The motor section adaptations would provide Vympel with a low risk path to an extended range variant of the baseline R-77 design. Foxhound: The Soviet follow-on to the Foxbat was the much more capable Foxhound, with a modern phased array air intercept radar. Above - MiG-31F demonstrator armed with R-37 / AA-13 Arrow (MiG Bureau). The Vympel R-37 / AA-13 Arrow was the first of the long range counter ISR missiles to emerge. It is equipped with an Agat 9B-1388 active radar seeker (below), and production variants are expected to be equipped with the new ARGS-PD seeker. The new R-37 was developed during the late 1980s to provide a very long range BVR missile for a range of Soviet fighters. 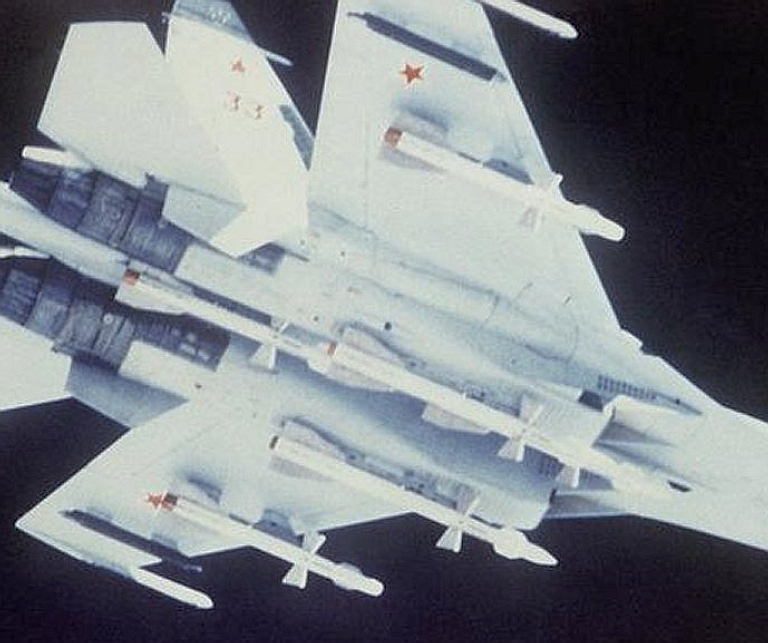 It is not as commonly believed a dedicated replacement for the AIM-54 Phoenix-like R-33 / AA-9 Amos, although the upgraded MiG-31M Super Foxhound was the trials platform for test shots - Russian sources indicate the missile was envisaged for the Su-35, Su-37, I.42 MFI and future types. The role of the R-37 also differs from the R-33 - it was devised to kill large ISR and IW/EW platforms at long ranges, specifically the E-3 AWACS, E-8 JSTARS, RC-135V/W Rivet Joint, EC-130 Compass Call and EC-130 Commando Solo. The missile uses large midbody strakes for enhanced lift, and folding cruciform tail controls for semiconformal carriage. A variant of the Agat 9B-1388 active seeker is employed, claimed to be capable of acquiring a 5 square metre target at 21.5 NMI. Production rounds are however likely to be equipped with Agat's improved ARGS-PD seeker. Range performance varies with the flight profile, from 80 NMI for a direct shot, to a maximum of 215 NMI for a cruise glide profile. In 1994 a trial round killed a target at 162 NMI, a record for a BVR missile. The R-37 is now in production to equipped upgraded Russian MiG-31BM Foxhound interceptors, and export MiG-31BM aircraft for Syria. Despite the early intent to integrate the weapon on the Flanker, this has yet to be reported. Recently redesignated the K-100/R-100, Novator's R-172S-1 AAM-L followed the R-37 into development, and is available with a booster pack to extend its considerable range performance to 400 km. The weapon is intended to kill AWACS/AEW&C and tankers (image © Miroslav Gyűrösi). Display mockup of R-77E and R-172S-1 (image © Miroslav Gyűrösi). Both the Iraqi and Serbian MiG-29 Fulcrums were not the top of the line Frontal Aviation variants, rather they were the 1980s export models with degraded capabilities. In the latter instances, a prolonged arms embargo and civil war in Yugoslavia resulted in poor availability of spares, and evidently non-functional radar and radar warning equipment during the Operation Allied Force air campaign. In practical terms these aircraft were flying blind and defenceless. 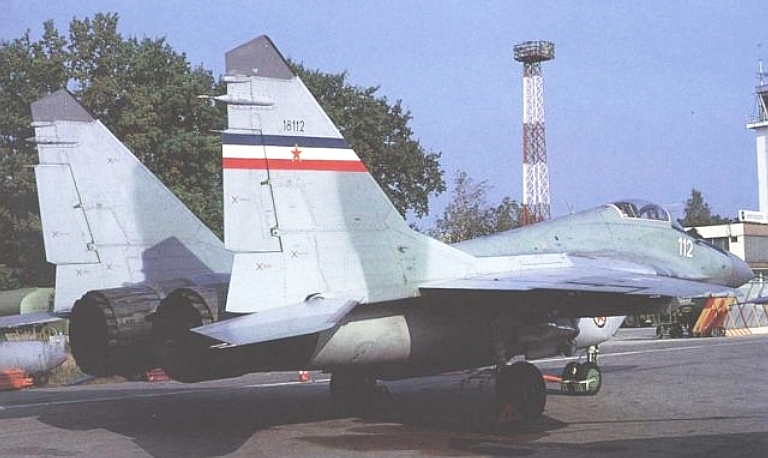 A detailed discussion of the Serbian MiG-29 force is available at: ACIG Team, Yugoslav & Serbian MiG-29s, Nov 30, 2003, URL: http://www.acig.org/artman/publish/article_380.shtml . Another consideration were the Rules of Engagement (RoE), which constrained firing opportunities and forced some engagements into the visual range environment, where the kill probability of the AIM-120 was much higher due to better kinematics, compared to maximum range shots. The latest Russian technical literature on the Su-35BM/Su-35-1 Flanker series shows that the KNIRTI Sorbstiya wingtip jamming pods are being replaced with a new design, which most closely resembles the G to J band TsNIRTI MSP-418K DRFM (Digital RF Memory - Цифровое устройство анализа и формирования радиосигнала (ЦУАФР)) based jamming pod, displayed at MAKS in 2003. The inclusion of DRFM capability is important, insofar is it is the current state of the art in Western defensive jamming equipment. A DRFM allows the equipment to digitally capture the hostile radar waveform with good fidelity, and then replay altered copies to deceive the victim radar. Refer MSP-418K URL: http://www.cnirti.ru/catalog-10-18.htm and 6-bit DRFM module URL: http://www.cnirti.ru/catalog-11-24.htm. The F-35 JSF is currently under SDD planning only funded for the integration and clearance of two internally carried defensive AIM-120 rounds. While the F/A-18E/F can carry up to 10 AIM-120s, with growth to 12 rounds, this is in an otherwise clean configuration denying carriage of external fuel tanks. With three external fuel tanks, its payload is reduced to six rounds, with growth to eight, the latter at the expense of performance. URL: http://stinet.dtic.mil/oai/oai?verb=getRecord&metadataPrefix=html&identifier=ADA339251; also URL: http://www.tti.on.ca/Crosseye.pdf. The use of software programmable loads for missile seekers complicates technical intelligence analysis and the development of counter-countermeasures enormously. With such seeker technology, missiles can be updated at depot or flightline level with new software fixes to overcome vulnerabilities observed in combat operations. Moreover, technical intelligence gathered by HUMINT or theft of hardware can be obsoleted very quickly, by loading new software into the seekers. Wartime reserve modes can be kept secure until combat operations commence, and then be loaded quickly just before operations commence. In effect the advantage in the rapid adaptation of electronic countermeasures held by the West during the Cold War period is largely nullified.